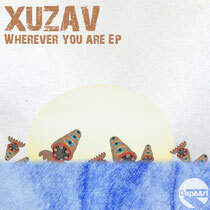 Madrid’s Depaart imprint opens 2013 with a three track package from Spanish producer Enrique Perez Sitjar aka Xuzav. Depaart launched in 2012 putting out three releases throughout the year from label founders, Georgeous and Moliner, which picked up support from the likes of Iron Curtis, DJ Deep, Halo Varga and Pawas. Xuzav has seen support in the past year from Richie Hawtin, dropping his ‘Run Ran Run’ cut at Sonar and Joris Voorn featuring ‘Disco Hitz’ track on his Ministry Of Sound compilation. ‘Wherever You Are’ opens the release here, a raw deep house cut with an ethereal feel. A choppy bass hook is introduced from the off, driving the track along while soft pads and vocal chops smoothly glide around the heady groove. The track slowly blossoms towards a warbling, resonant synth melody in the latter stages, resulting in hypnotic house record with a dark edge. Next up is ‘Donut Bass’, built around a busy drum pattern and sub-bass rolls. Enrique plays on a dark, trippy edge once again here with an ever-evolving feel embodied in the track. A deep acidic bassline carries the weight of the cut while white noise sweeps and elongated delays on the synth parts create a profound background depth. To close the release Xuzav turns in ‘Raw Party’ and as the name suggest the track takes on the form of raw, stripped back deepness. The Spaniard opts for sparse minimal elements and utilizes subtle automation on each part to create a warm, low-slung house track with an insistent direct approach. It’s out today.